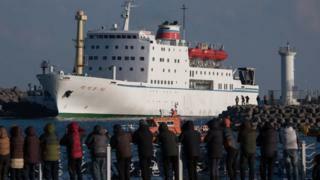 One North Korea ferry enter South Korean border on Tuesday with dem art people to perform for di Winter Olympics wey dey start on Friday. Dis na di first time dis don happen in sixteen years. Dis na after attack for 2010 on South Korean navy warship wey bin kill 46 sailors although North Korea say no be dem do am. As di ferry Mangyongbong 92, bin dey enter di port for Mukho, plenty people bin dey protest against Kim Jong Un as dem get im picture of am with black crosses over am. No unified Korean flag bin dey for di protest. Di ministry bin talk say dem decide to allow North Korean ships enter for di main time, so dat dem go "support di successful hosting of di Olympics" wey go start on Friday. South and North Korea go march for Unified flag for di opening of di games.